Former Silver Fern, Margaret Foster has dedicated her life to developing netball and has a reputation for telling it straight whilst doing so. Marg represented her country, New Zealand, playing for the Silver Ferns back in the 1990's and has gone on to coach at international, franchise, university and grassroots level netball all over the Globe. Most recently Marg has joined the Silver Ferns coaching line-up ahead of the 2019 Netball World Cup. 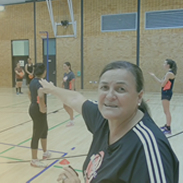 Marg does not just lend her hand to the top level of netball development. She has a real passion for getting the best out of young netballers as well as inspiring coaches to be the best they can be. Marg is Director of Motivationz- Motivationz run quality coaching programmes for young netballers, and Marg and Motivationz have been working with us here at Sportplan to bring you new, blue ribbon drills. A key theme is apparent across all of the training sessions- intensity. "It is up to us as coaches to lift the level and lift the intensity"
During Marg's training session, regardless of the drills main focus, she ensures the players eventually achieve 100% success. Whether this be an individual completing a full run through of the drill, shooters not converting their shots at the end of a drill or feeders not executing their passes correctly. All aspects of a drill need to be correct before progressions are made. The aim: 100% success. Do not move on until the players have got it. Whilst straight shooting when it comes to errors, Marg is sure to never miss the opportunity to acknowledge positive performance. Enthusiasm is ample in her training sessions! Remember to make adjustments when players are fatigued. If the drill is taking several attempts to complete, fatigue will become a factor. It is important for players to experience these conditions as it is inevitable for this to happen in game situations. Players must adjust to their teammates limitations when fatigued. Emphasise to your players the importance of being under pressure at training so that they can execute the necessary skills on game day when the real heat is on. When it comes to getting the best out of players, Marg's bags of experience is evident. Eventually this Zig Zag drill was executed and the players experienced the feeling of success after a number of failed attempts. Marg used these failures as learning experiences and to fuel emotion in the players so that they used this to make the corrections, not only for themselves but for the team to also experience success.